ULINKplus requires MDK v5.25 or higher. Required USB drivers and a firmware update are automatically installed when you connect ULINKplus. 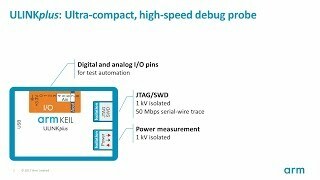 This quick start tutorial shows how to use MDK debug and trace features with the new ULINKplus debug adapter. It explains the hardware connection to a target, shows the debugger configuration and demonstrates the following MDK features: Live Watch, Component Viewer, Event Recorder, Clock frequency measurement, exceptions and data trace. 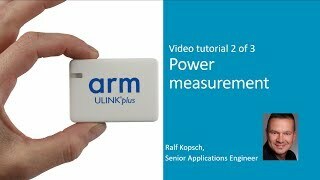 This quick start tutorial shows how to use the power measurement feature of ULINKplus. It explains the hardware connection to a target, shows the required configuration and demonstrates power measurement using the µVision System Analyzer. 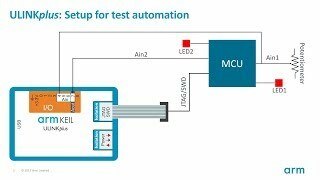 This quick start tutorial shows how to use ULINKplus integrated IO pins for test automation. It explains the hardware connection to a target, shows pin configuration in µVision and demonstrates manual and script-based control over the ULINKplus IO pins.